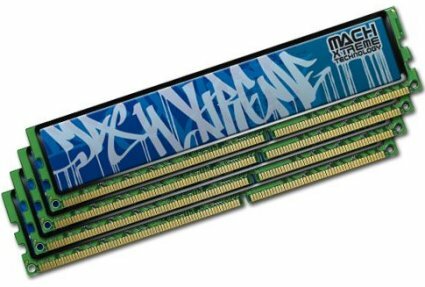 Mach Xtreme presents quad-channel Urban DDR3 for Intel's Sandy Bridge-E.
Mach Xtreme Technology Inc., a worldwide leader in top performance, high reliability and user-friendly designed PC components, today unveiled Urban Series Quad-Channel DDR3 memory kits giving demanding enthusiasts exactly what they need. The kits are optimized for Intel X79 express chipset based motherboards. Urban quad-channel DDR3 modules offer desktop users groundbreaking computing experience at an attractive price point. Featuring enhanced capacity of 4GB per module, these new high-density 16GB kits provide customers with cutting-edge memory solution that significantly increases memory space driving breakthrough gaming and digital media content creation performance of X79 based systems. Each kit is designed to work as a kit and users working with the latest operating system can keep multiple applications open or run smoothly memory intensive graphic programs. The uniquely designed lightweight heatsink is made of specially imported top grade Japanese aluminum. Each module is 100% hand-tested for quality assurance and is backed by lifetime warranty. Coupled with an attractive price, the Urban 16GB kits are an excellent choice for your X79 upgrade.